It is obvious that you just cannot eat pizza if you're on a low-carb diet. Well, that's no longer the case because you can now opt for fathead pizza. Your fathead pizza is free from any gluten, and grain, and contains fewer carbs as well. It's delicious and it is incredibly filling. It makes use of cream cheese, cheese and ground almond flour. Don't know how to make your first fathead pizza low carb? 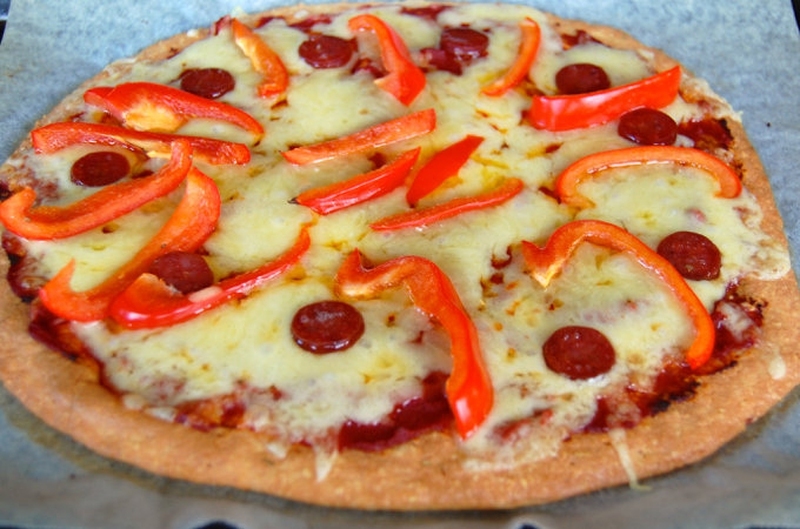 Keep reading to learn everything about making fathead pizza with utmost ease. Instead of opting for the regular pizza, you can consider making highly nutritious fat head pizza at home. The best thing is that the pizza will have no more than 2.2g of carbohydrates. The fathead pizza low carb will also have fewer calories as compared to your regular pizza. It contains only 223 calories with 13.1g of protein and 17.4g of fat. What's more, the fat head pizza you make at home will be free of any artificial flavoring and preservatives. Here's how you can prepare this healthy pizza at home. Note: if you like, you can use some cherry tomatoes, peppers, pepperoni, olives, herbs or mushrooms for toppings. Put the cream cheese and grated cheese in your microwave bowl, and set your microwave on high for a minute. Stir it and set in your microwave on high for another 30 seconds. Add the salt, egg, ground almonds and other flavorings to the bowl and mix well. Roll it into the shape of a pizza by placing it in between two baking sheets. Take off the top baking sheet and check the mixture for softness. Use a fork to make holes all over the pizza base. Place this pizza base on a baking tray covered with the baking sheet. Set the temperature to 220 and bake for about 15 minutes. Remove it from the oven when it turns brown. Now, you can add toppings and bake again for another five minutes. While you can always make a fathead pizza at home, that's not the only option you have. There are a number of other low-calorie pizza recipes you can try if you are on diet. Here we have selected three highly delicious yet low-calorie pizza recipes to help you make a pizza with little effort. Take a 12-inch nonstick skillet and heat it over medium-high heat. Use your cooking spray to coat the pan and add shallots and mushrooms to it. Sauté until mushrooms are a bit tender. Now, add thyme and garlic to the pan and sauté for another minute or so. Stir in vinegar and take it off from heat. Now, place pizza crust in the oven on the bottom rack and bake for 4 minutes at 450 degrees temperature. Place your crust on a baking sheet and spread the mushroom mixture you have prepared already over your pizza crust. Use fontina cheese and prosciutto as well and bake it at 450 degrees for another 6 minutes – make sure the cheese melts completely. Take a large nonstick skillet and heat olive oil over medium heat. Add garlic and onion and cook for 4 minutes. Now, stir in salt, tomatoes and pepper, and let the mixture to boil. Reduce heat a bit and simmer for 15 minutes to have thick paste. Now, stir in basil and parsley as well. Take it off and let it cool off completely. Use your dough to roll into a circle on a lightly floured surface. Place it on a baking sheet coated with cooking spray. Use your fingers to crimp the edges of your pizza dough to make a rim. Take your tomato mixture and spread it evenly over pizza crust, just leaving ¼-inch border. Top it with turkey and sprinkle cheeses as per your liking. Bake at 400 degrees for another 10 minutes. It's ready when it turns golden. Preheat your broiler and cut bell peppers in half (cut them lengthwise). Don't use membranes and seeds. While keeping their skin sides up, place your bell pepper halves on baking sheet. Use your hand to flatten it completely. Broil it for 15 minutes and then place it in a plastic bag – take a zip-lock bag for proper storage. Seal the bag and leave it for 15 minutes. Now, peel it into small strips and combine with green olives, bell peppers, and black pepper in another bowl. Now, preheat your oven at 350 degrees. Spread your bell pepper mixture over pizza crusts and use cheese for sprinkling. Put it in the oven and bake for 7 minutes. You can also click HERE to get more healthy pizza recipes.